Recently launched, SeedBoxCenter, entered dynamically into the seedbox business and today it’s going to present to us two of their packages. We do not know much about the company itself but their packages seem interesting enough to take a look at. 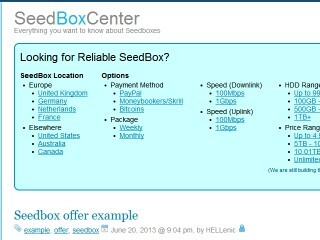 We are going to present to you today two of SeedBoxCenter’s plans, a monthly and a weekly one. Both are named “Seed till you die”. The seedbox stats are almost the same with a small difference between their bandwidth, setup fee, money back guarantee, coupon and of course price. Both of them give you a nice 250GB disk space with 1GB of RAM on a 100Mbps (Up/Down) line. They are semi-dedicated plans (you are sharing the server with one more customer) with a shared IP between the two customers. There is no limitation on the number of active torrents although they do not allow public trackers and you may choose between ruTorrent and Deluge client. They both also offer Free VPN. You can catch them online either on Skype or through email (they are pretty fast at getting back to you) on a daily basis. Finally you can grab a seedbox at the price of $7 for the weekly plan and $20 for the monthly plan (10% off coupon available below at the table), paying by either PayPal or anonymously with Bitcoin and have it ready within the next 12h. The monthly plan comes with a 3 day money back guarantee so you’ve got nothing to worry about but if you insist you can test it first with their 24h trial. You can find the table with full information about the plans below.